Salmon is a healthy meal for a weeknight. 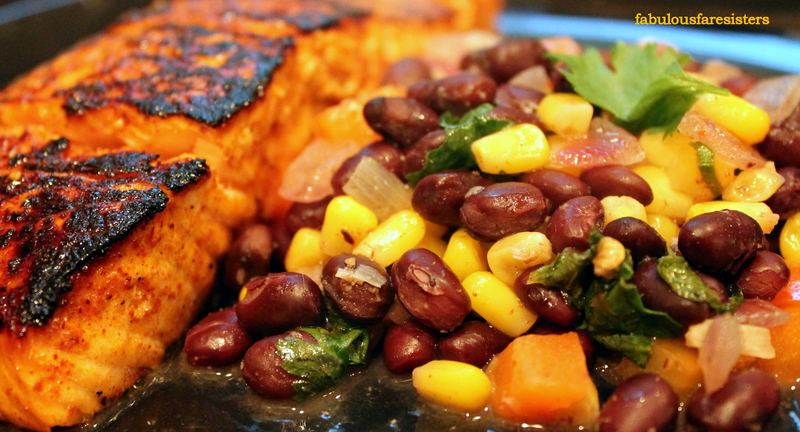 This tasty glazed salmon is accompanied by a salsa made of corn & black beans. Hearty and healthy…but also so quick that you’ll be eating in under 30 minutes. Enjoy! In a medium skillet, heat a tablespoon of olive oil over medium-high heat. Toss in the onion, garlic, red pepper, crushed red pepper flakes, cumin, one teaspoon salt & pepper. Sauté for five minutes. Add the corn to the skillet and sauté two minutes. Stir in the black beans and chicken broth. Heat through; sprinkle with the cilantro. Add the zest and the juice of one lime. Reduce the heat to low. Continue simmering until the salmon is cooked. In a small bowl, combine the zest & juice of the second lime with the honey, chili powder and a teaspoon salt. Pour over the salmon fillets and marinate a few minutes. Turning salmon over to soak both sides in the marinade. Heat some extra virgin olive oil in a cast-iron skillet on medium/medium-high heat until hot. Place salmon in hot skillet and cook on the first side 3 minutes. Gently turn salmon over and cook an additional 3-4 minutes until salmon is cooked to your liking. The honey-lime-chili glaze produces a nice crust on the outside. Serve the salmon fillets with the Black Bean & Corn Salsa on the side. All your recipes look as if they’d taste amazing! It looks so delicious!!! WOW!! Your best post ever!! OMG! I love Salmon…what time was dinner? I missed it!!! NO, say it ain’t so!! Bookmarking this one. I have to try it.! Salmon is my fav fish to cook at home so I will def try this recipe – corn is the best! Great! Hope you love it as much as we do…and the corn salsa is so good! I’m always looking for new side dishes to serve with salmon. Yum! The Black Bean & Corn Salsa is a great side! I also use it sometimes on tacos…yummy! I can see that. I love the color, too! Oh, man. Now I am hungry! I can’t wait to try this one.